During Native American Heritage Month each November, we celebrate the rich histories, diverse cultures, and important contributions of our nation’s first people. We recommit to honoring the nation’s responsibilities to American Indians and Alaska Natives. At ACL, this means working with tribes to better serve the health needs of elders and people with disabilities in Indian Country. One initiative that is working well for tribes is the Wisdom Warriors program. Developed by Shelly Zylstra, an aging services program specialist in ACL’s regional office in Seattle, Washington, and Becky Bendixen, a tribal specialist for the Northwest Regional Council in Bellingham, Washington, the program helps tribal elders improve their health by better managing chronic illnesses. Wisdom Warriors is based on the Chronic Disease Self-Management program developed by Stanford University. Over the course of six weeks, tribal elders eat traditional foods, participate in cultural activities, and discuss health traditions. The program provides people with tools they can use to manage numerous symptoms for a variety of chronic diseases. After completing the course, elders graduate as “Wisdom Warriors” and receive a special medicine pouch, which are worn to monthly support meetings that continue after the course. At the meetings, they celebrate each other’s success in reaching a variety of health milestones, which are recognized with decorative beads worn on the medicine pouches. 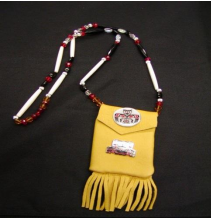 The pouches identify them as participants in something special, which helps generate interest in the program, and the beads highlight their individual accomplishments and help motivate continued improvement. I am very excited by our success with Wisdom Warriors and want to call attention to it during this observance of Native American Heritage Month. Also, I want to share more good news about Becky. The NW Regional Council is making great strides with special initiatives and includes tribes in their daily activities. The approach is working — the medical providers on the Tulalip Reservation have commented that “something is going on” with the elders because they are getting healthier. This is a direct result of Becky’s good work as a Master Trainer for Wisdom Warriors. She also recently received the 2017 National Impact Award from the National Indian Health Board for her contributions to improving American Indian and Alaska Native health at a national level. The NIHB recognized that the Wisdom Warriors program has truly enriched and improved the lives of tribal elders. I challenge all tribes across the nation to learn more about the Wisdom Warriors program. It is easily replicable and cost-efficient. We need to better serve the health needs of our tribal elders. Get involved and make this program work across all of Indian Country!